Most eight year olds celebrate their birthday with cake, ice cream and friends and family. 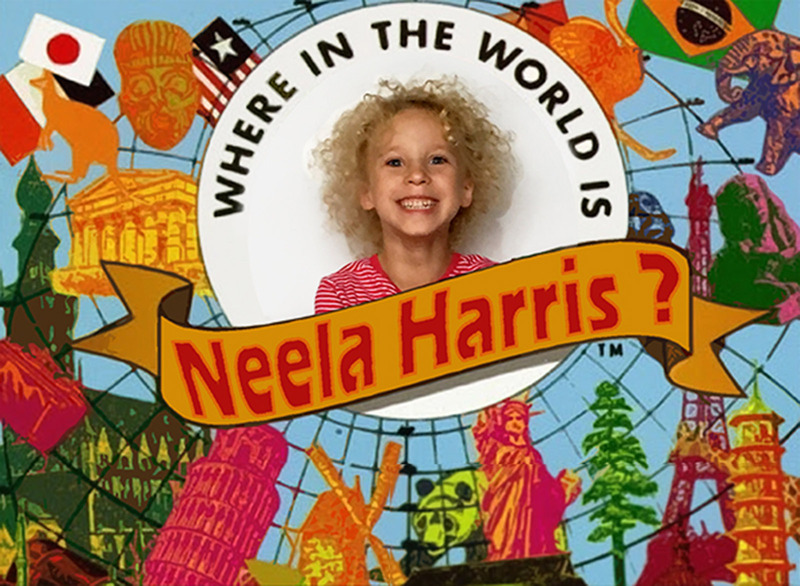 Not Neela Harris, who spent her eighth birthday flying in business class around the world. At age eight, Neela now enjoys Delta Air Lines Diamond Medallion status, the highest recognition frequent flyer status the airline publishes. Neela accomplished her feat in a single 10-night around-the-world mileage run, accompanied by her mother and, for a few segments, her father. Neela Harris, 8-year-old Delta Diamond Medallion. Image by Shawna Noel Photography. Shannon Harris thought it might be possible for Neela to reach Diamond in a single trip. With a couple trans-continental family vacations planned, and no desire to pay cash for those oh-so-comfortable lie-flat business class seats, Harris and little Neela had a lot to gain. The status would allow Neela free upgrades from the cheapest available economy tickets to DeltaOne business class, on four flights each year. Those seats often cost multiples of economy tickets on the same flight. To pull off Diamond status, for Neela, was to bank the equivalent of over $20,000 in perks. Spending a few grand to complete the necessary flights was a no-brainer, but finding flights that would work was a puzzle that took hours upon hours of research and careful calculation based on previous client outcomes. Harris called Juicy Miles’ one-of-a-kind mileage run consulting service to see if it would be possible for soon-to-be eight-year-old Neela to become one of the airline’s youngest Diamond elites. That’s when we were introduced, and where my story begins. I have consulted Juicy Miles clients on some pretty highly leveraged Delta mileage runs, but this request was particularly daunting. Neela had no status at the beginning of this trip. Delta Diamond status is also the most difficult published elite status tier in the airline world. Under normal circumstances, flying on regular discount Delta tickets, flyers have to spend over $15,000 and spend over 125,000 flying in airline seats in a calendar year. For those of us who take mileage running as a hobby, getting little Neela from virtually zero miles to Diamond status in a single itinerary was a challenge paramount to scaling Everest. Conversations led to a sort-of-matrix of intermingled flights that would, miraculously, meet all of Delta’s Diamond status requirements. I designed four trips nested within each other to maximize both of their earnings in the least time at the lowest cost. We would take advantage of sweet spots in Delta’s SkyTeam partner award earning charts. Namely: business class trips, even when discounted, often earn bonuses that boost qualifying miles, and they also count significantly more toward qualifying dollar requirements. The rate at which Neela would earn miles on partner airlines in business class would be determined based on the fare class she would travel in, not on the specific price of the ticket. This was the secret that would unlock Neela’s special Medallion status. Since Neela is home-schooled, travel was easier than for her older siblings. Harris would be able to travel with Neela and keep her studies going on the road. She incorporated specific geography and relevant country discussions into the study sessions both in-flight and during layovers. Neela and Mom set off from their hub captive airport, Minneapolis, to re-position to an airport with more favorable fares for the long-haul itinerary. ‘Hub captive’ airports like Minneapolis, pose both a problem and an opportunity for mileage runners. These are airports where a significant amount of traffic is controlled by a single airline – in Minneapolis’ case, Delta, meaning fare competition is less and fares, thus, are higher. To get around these high fares, Neela and mom flew to New York’s JFK airport, one of the most competitive airports in the world, and thus one of the cheapest for international fares. Those repositioning flights (to and from MSP-JFK) were booked in Delta’s Main Cabin. As a Diamond Medallion herself, Harris would be able to upgrade daughter Neela as her companion on the domestic legs, anyway. They chose to fly coach on China Eastern; the SkyTeam partner to reach the Asian airport of Cebu as the fares were very cheap and still earned 100% MQM’s credited to their Delta Medallion accounts. The designed trip was largely based on two separate business class itineraries to and from Shanghai. China Eastern, a Delta SkyTeam partner, was offering roundtrip flights in heavily discounted lie-flat business class through their Shanghai hub. The trips took the mother-daughter duo from Cebu through Shanghai to Madrid and back — in business — at an incredible $1120. The deal was so good – netting over $6,000 in Medallion Qualifying Dollars – that we booked two of them, back-to-back. These long-haul flights would be separated by a layover night and day at the Cebu-Mactan airport in the Philippines During their layover. Neela and enjoyed a nice hotel pool, nearby ocean beaches and plenty of sun to refresh after the back-to-back long flights. The turnarounds in Madrid were less than two hours. The plane would land, Neela and parent would disembark, wait for the aircraft to be cleaned and re-stocked, and then re-board the same aircraft to return. China Eastern is China’s second-largest national airline, with modern business class accommodations on their long-haul fleet of jets. At JFK, they boarded MU’s flagship 777-300ER, equipped with the airline’s best reverse-herringbone style business class seats. China Eastern might not offer the most acclaimed business class in the world, but their modern seats are more than adequate for mileage running. China Eastern’s premium cabins on the 777 feature some nice touches. The second leg of their journey was operated by an Airbus A330. Historically, SkyTeam flyers have been inclined to shun the airline’s Airbus fleet, but many of these aircraft are now newer and offer fully lie-flat seats. This is the same jet that Neela would fly on her trek to Madrid and back. Neela’s adventures earned her not just elite status, but a special sign at home and reputation among her friends as the foremost grade school globetrotter. For Neela, the trip amounted to a special vacation of sorts. She loved the flowers inside each of the business class cabins she flew. She got to spend time by the beach, and in between fun she was able to keep up with her at-home studies. Now, she enjoys perks and recognition typically reserved for the world’s most traveled business executives. Asked if she has any regrets, Harris’ posits that she would have spent more time enjoying the stopover destinations they visited as a family. “I would probably spend more time in the remote Asian destination as well as Madrid. Mileage Running can be very exhausting” she said. The airline wouldn’t confirm or deny that Neela is the youngest Diamond Medallion in the system, though we believe she is. Delta’s communications team did have some words of encouragement for little Neela’s big accomplishment. Congratulations to Neela on achieving Diamond Medallion Status! All of us at Delta are proud to help connect Neela on her journey and can’t wait to see where 2019 takes this young traveler on her adventures. ‘Littlest Diamond’ Neela transits Quito airport like a pro! The fare sales we used to accomplish this run were uncommonly good. Even so, the whole feat was accomplished for an astonishing $1,200, out-of-pocket. Harris could have paid for the entire run out of pocket, but as an avid frequent flyer and points collector it actually made good financial sense to hem some of the cost using accrued credit card points (particularly those she’d be earning back on this trip). We used a combination Chase Ultimate Rewards points, FlexPerks from US Bank and American Express Membership Rewards. Using American Express’ 35% rebate on Membership Rewards points to purchase flights on their primary carrier (Delta) and business class fares with the partner carrier, and using the Chase Ultimate Rewards travel portal and earned points the family was able to buy down the entire cost of the airline fares to about $1,200 out of pocket for Neela’s Mileage Run. Dad took one of the long-haul mileage run trips with Neela, combined with the positioning flights, and was able to earn back his 30,000 MQMs. Have you ever considered helping your children become elites in an airline program as a part of your family’s travel strategies? Let us know in the comments. What was the complete routing of this trip!? Great story, I’m happy for Neela and her family, and I have to make sure my 11 YO son doesn’t read this because he’ll want to do the same thing. However, the article, until the very end, and the headline are a bit disingenuous, don’t you think? Far more honest, though admittedly less click-baity, to headline it something like 8 YO earns Gold on one trip. Not sure where you saw that. Neela is Diamond, not Gold. Taking advantage of credit card bonuses is fully part of the mileage run process and the service that is offered. Don’t misunderstand, she made Diamond and I think that’s great. Kudos. But the headline makes it sound like she earned 125K MQM by flying, when in reality she got some number of MQM gifted from her Dad’s Reserve. She ‘earned’ Gold or Platinum, the same as my wife earned general member and I’m going to gift her Gold, same as the MQM gifted by her dad resulted in Neela making Diamond. Again, great story, but the headline was misleading, s’all I’m saying. Using credit card benefits is an integral part of mileage run strategy. You cannot, in this context, separate leverage from the process. Actually, it was 30,000 MQM’s, and most Mileage Runners and people seeking status consider credit card earn bonuses as a part of their strategy. The parents considered their options, plotted and executed a successful plan. It was a Win-Win for all! How did you use a Delta Global Upgrade Certificate on China Eastern? As far as this DM knows, they are only valid on Delta, AirFrance, KLM, Korean, Virgin, and Aeromexico. None of the Chinese airlines accept Delta global upgrades, so super confused how you all upgraded JFK-PVG using a Delta GUC when it can’t be used on that route. You are correct. Those China Eastern flights (to get to the Cebu starting point) were paid coach tickets. I have made that change in the article which was incorrectly worded. Like the mother stated in her interview “Mileage Running can be very exhausting” and often the coach segments are the most grueling, but often is a calculated cost of running for status. It’s a bit of bait and switch here. Yes, a child earned Diamond on one mileage run, but only with the assistance of 60k EQM earned by her parents charge cards. Interesting as a one-off story (like pudding guy) but not really feasible for most travelers with limited budgets. Also pretty unique to DL, you would not see those upgrades on hub flights as a UA 1K. Show me a kid whose earned too statue by actually flying 100k miles (and whose parents spent $15k on tickets) and I’ll be impressed. Actually it was 30K MQM’s which was from a spend bonus and this is something we encourage throughout the Mileage Run community when it makes sense to reach a targeted goal. Credit card strategies have always been an effective tool to meeting status. The point of a leveraged mileage run is to earn status without flying and spending published requirements. How did she meet the Diamond MQD requirement with only $6K in MQDs? Actually, they did that inner Mileage Run twice. So, it was closer to $13,000 in MQD’s after those two nested Mileage Runs. As others have mentioned, it is not possible to use DL GUCs on MU; this is such common knowledge that I would steer far clear of any “booking service” that was so clueless. I apologize for the initial confusion and can assure you that Juicy Miles’ team is aware of all the ins and outs of the airline programs and proper uses of upgrade certificates. the article says they boarded MU’s flagship J product at JFK – but how did they do that if the flights to CEB (which I assume a flight from JFK would be to head to start the CEB run) were in coach as you said? Were they op-up ed? Or did they pay for an upgrade? Something else? “They chose to fly coach on China Eastern; the SkyTeam partner to reach the Asian airport of Cebu” so although the aircraft was equipped with the shown equipment, the J product was for the two nested Mileage Runs (CEB-PVG-MAD-PVG-CEB). Sorry for any confusion. Coach for positioning to get in place (at Cebu) for the promotional Business Class fare deal.